Zip Kit 02 has officially launched! It’s been a long time since we have released a new Zip Kit, but the next addition to our collection has finally arrived. 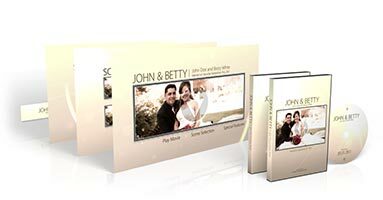 Our Zip Kit templates have increasingly become a popular alternative to our Pro Motion Menu Kits as they come pre-rendered and ready to author directly from the Adobe Encore Library (no After Effects rendering required). Though our Zip Kits do not offer any menu transitions or sound effects, they will certainly give your project a professional appearance. Just as you’ve come to expect from Precomposed, this new design is clean and professional, and perfect for a wedding or elegant event. The moving lens flare, floating particles, flowing lines and ornate accents of this design make it a great addition to your collection. But the images alone don’t do this menu justice, so make sure you watch the Live Interactive Demo on the Zip Kit 02 product page!